As I planned my son's 3rd birthday party I knew I wanted to do something different for the party favors. Of course the party favors had to go along with the theme of the party too. The theme of the party was "Arts and Crafts". 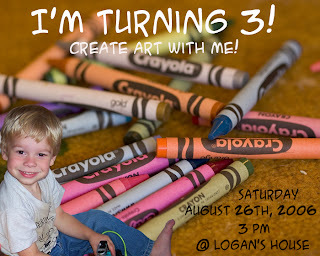 I created his invitation in photoshop. 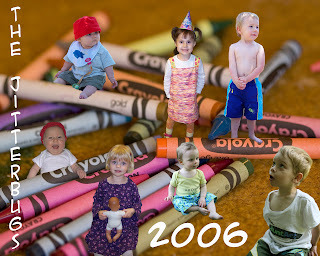 And one night I got this brilliant idea to create another photoshop image and to add pictures of all the kids who were coming to the party. The party was a small group of really close friends. Actually a playgroup called the "Jitterbugs", we've met every week for the last 3 years! So I created the image, printed it out on iron on paper (found at your local office supply store) and ironed the image on to white t-shirts. Any type of t-shirt will do as long as it's a light color. Just remember to reverse the image before printing it out or else any words you have will be backwards. And wha-la a funky t-shirt for each kid as the party favor! The moms were so excited about it...not only adorable picture of all the kids but also a usable gift. I'll be doing this again for future parties.